It was a big day yesterday internationally for anti-Masonic folks. First in Malaysia, several Non Governmental Agencies (NGOs) in the city of Penang filed no less than nine police reports yesterday designed to put a stop to an International Scottish Masonic Conference taking place there this month. And if the cops don't shut it down, these guys vow they will. A week ago, a Muslim man there made the headlines over his protest against the Conference on religious grounds. He is a member of Umno Youth, an outgrowth of the United Malays National Organization, the largest political party in that country. Now, the complaints have widened to nine different political and religious groups all protesting the Masons. 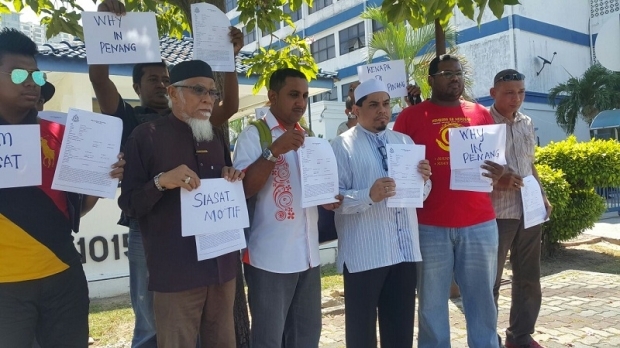 The groups including Gabungan Perwakilan Melayu, Persatuan Muslimim Pulau Pinang, Perwira and Persatuan Muka Buku Pulau Pinang also lodged nine police reports today against the Scottish Masonic Conference. “After looking through their website about the conference and although they have been in our country for a long time, we still feel uneasy and uncomfortable with such an international conference to be held here in Penang,” said Mohd Hafiz Mohd Nordin, chairman of the Jaringan Muslimim Pulau Pinang which is an umbrella body for 13 Malay non-governmental organisations. He claimed the Freemasons were linked to Zionists and propagated “evil conspiracy theories against Islam and Muslims”. He further claimed that the organisation was masquerading as a welfare movement, but could have a “secret agenda that even the media are unable to reveal”. No evidence was provided to support any of the allegations. “We want the police to investigate the conference, to find out what it is about, to check if the organiser is a registered society, to find out their activities here and why they chose to hold it here in Penang and at the Bayview Beach Resort,” he said, adding that they also want the police to investigate if the hotel had any links to the organisation. In his police report, he urged the police to stop the conference if it posed a threat to the harmony of the society especially if it causes discomfort and uneasiness among Muslims.“If the police don’t stop them, we will stop the conference because we do not want it to be held here,” he said. The four-day Scottish Masonic Conference, to be attended by Freemasons from 15 countries worldwide, is scheduled to be held from February 24 to 27. Freemasons in Malaysia are chartered under the District Grand Lodge of the Middle East under the Grand Lodge of Scotland. Also in Malaysia is the District Grand Lodge of the Eastern Archipelago under the United Grand Lodge of England. The country has a Sunni Muslim-majority that makes up 61% of the religion practiced there, and Constitutionally, Islam is the official religion. In fact, government-issued identity cards plainly identify the religion of each citizen. Minority faiths, particularly Christianity, are routinely persecuted by the government. UPDATE on FRIDAY FEBRUARY 19th! The Foreign and Commonwealth Office (FCO) advise against all but essential travel to all islands off the coast of eastern Sabah from Kudat to Tawau, including (but not limited to) Lankayan, Mabul, Pom Pom, Kapalai, Litigan, Sipadan and Mataking. There is a high threat from terrorism. Attacks could be indiscriminate, including in places visited by foreigners. In January 2016, the Malaysian police said the country was on the highest security alert; from time to time the police presence increases in public areas. There is a threat from kidnapping in East Malaysia, particularly on the islands off eastern Sabah due to its proximity to the Sulu archipelago in the southern Philippines. There has also been a case in Sandakan on mainland Sabah. Boats travelling to and from off-shore islands and dive sites are possible targets. The Abu Sayyaf Group, based in southern Philippines, has previously kidnapped foreigners from the east coast of mainland Sabah, the islands and the surrounding waters. A number of hostages have been murdered by the group. The Malaysian authorities have increased security in the region in response to these incidents. Malaysia is an oddly constituted nation geographically, as it is divided into two different, completely isolated regions that are split roughly in half by the South China Sea. The city of Penang, the location of the International Scottish Masonic Conference, is on the far western coast of what is called Peninsular Malaysia, while the resort area referred to on the Foreign Office website is on the far northern and eastern coasts of Eastern Malaysia. This terror warning does not affect the city of Penang, but it does highlight the jeopardy that both Malaysian and foreign sojourning Freemasons who openly disclose their membership can face there. Sadly (and alarmingly), accusations made by the aforementioned anti-Masonic Muslim organizations in Malaysia can result in more than just an annoying irritation. The interview was translated by the MEMRI website, which is an invaluable resource for providing Arabic media stories in English. “We know that Marine Le Pen got closer to some movements that control public opinion in France,” Hatem, a Maronite Christian of Lebanese descent, told Al Arabiya TV last week. A transcript of the interview was translated from Arabic by MEMRI. “She did so in order to whitewash the National Front. These movements include Zionist movements and Freemasonry which control the press and the government in France,” Hatem said. The Al Arabiya interviewer interrupted Hatem, saying it was up to the French authorities responsible for the media to answer the allegations. “I am against the idea of secularism espoused by Marine Le Pen, as I told her on several occasions,” Hatem said. “The Freemasons were behind the secularism and they founded the French republic government on the three principles defended by Freemasonry: liberty, equality and fraternity,” he said. In 2014, Hatem was the National Front’s candidate for mayor of the 4th arrondissement of Paris. He was a curiosity of sorts at the time, being the first Action Francaise member to stand for election in any capacity in 20 years. Action Francaise is a far-right monarchist movement established in 1899 in reaction against the support of left-wing intellectuals of Jewish French army officer Alfred Dreyfus. Maurras, mentioned by Hatem, became the movement’s ideologue and steered it in a Catholicist, anti-secularist direction. Maurras called for the reversal of the principles of the French Revolution. Maurras was imprisoned after World War II and the movement’s popularity waned. Its ideas, however, remain influential in some circles of the French far right. One thing that my own studies and travels abroad have shown me is that Masonic principles can be perverted to serve agendas that don't fall in line with Masonic teachings or negative conduct exhibited that those of us who strive to live according to those teachings would regret to see in those we call "Brothers". While many of us may disagree with the protests against our fraternal order, it seems imperative that we be aware of and mindful that there is often a cause/ catalyst that we may be unaware of being so far distant from these type of protests and complaints. Disclaimer: I have offered a personal opinion and observation that does not represent my lodge, grand lodge nor any other group I may hold membership or affiliation with.